Warf Rescue Team is a nice simple game that, with a little practice, will bag you an easy 1,000 Neopoints in a short space of time. Once you get the hang of it you can add it to your dailies as a quick, five-minute game to boost your income for the day. There isn't very much to say about it, really, but here are the important bits. 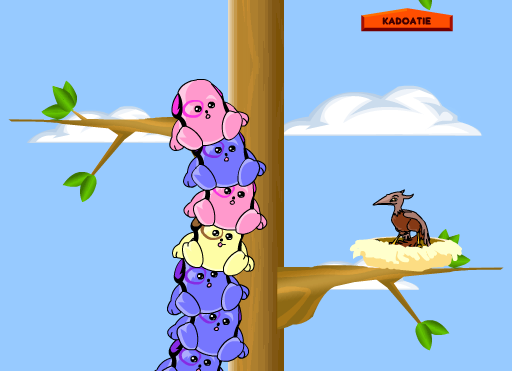 The object of the game is to rescue the poor little Kadoaties that have gone and gotten themselves stuck up a tree. We shall overlook the small matter of how they got there in the first place though; we don't want to embarrass them now do we? But regardless of how, the little guys are stuck on the branches of a tree and have enlisted your help to get them down. On closer inspection, this game makes no sense at all... Apart from the unexplained rise in the popularity of tree-climbing activities amongst Kadoaties, it is also a mystery as to why they would then contact a team of Warfs to help them down; what with Kads being related to cats and Warfs being related to dogs and all, you'd think the Warfs would arrive and then promptly burst into laughter, rather than shimmying up after them. And that's another thing, how huge is that tree? I mean, it doesn't seem to have an end to it! But this is quite besides the point and won't get you anywhere, so shall we get back to the matter at hand? Since this is such an old game the graphics and general layout are very basic. As you can also see, you're not alone in the tree; as you progress you will spot Airaxes sat in their nests watching you, as well as the occasional Buzzer flitting back and forth and some odd critter who hides in holes in the tree and hurls acorns at you. I know, how rude. If your Warfs come into contact with any of these obstacles then their parachute will deflate; it won't cause them to fall out of the sky, but it will dramatically reduce their upward momentum and cause them to start coming back down earlier than if they still had their parachute. You begin with 98 seconds on the clock and your time will gradually tick down. 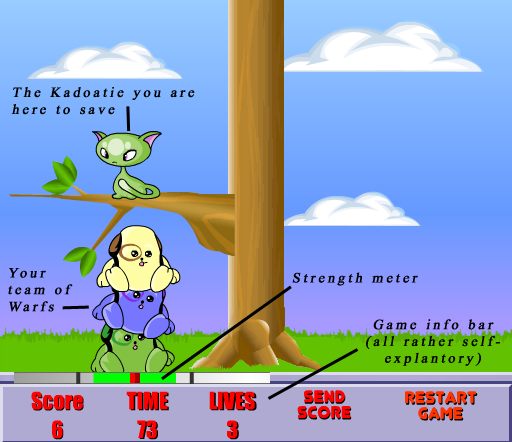 You can replenish it, however, by rescuing a Kadoatie; each Kad translates to an extra 25 seconds added on to your time. If you run out of time then that is the end of the game. You also start off with three lives; these are lost by firing a Warf and missing the tower so that it falls to the ground. Once all three lives are gone it's game over too. You control how high the Warfs are fired up into the air using the strength meter at the bottom of the screen. The green square will move back and forth and when it is inline with where on the screen you want to fire your Warf click the left mouse button and HOLD it down. The green square will then turn into a red one and a little green bar will grow and then shrink back down around it, this measures how much force you want to shoot the Warf up into the air with. The more the green bars fill the little black brackets, the more force the Warf will be projected with and so the higher up it will go. Once the bar reflects how much strength you want to put behind it, release the left mouse button to fire the Warf. Each Warf you successfully add to the tower will earn you 2 points. Each Kadoatie you rescue will earn you a further 10 points. You can receive a 'colour bonus' of 1 extra point as well for stacking three Warfs of the same colour on top of each other, this multiplies the more Warfs of the same colour you manage to stack. However, the colour of the next Warf is determined randomly by the game so there isn't much you can do to control when that will happen. If you get one Warf exactly on top of the one before it then you get a 2 point 'perfect bonus', this is particularly hard to do unless you manage to fire 2 Warfs off in extremely quick succession. This bonus accumulates and doubles with each perfect landing you get in a row; it begins with 2 points, then increases to 4, then 8, then 16 and so on, up to a maximum of 64 points. If you get a less-than-perfect landing though, your bonus will start over again from 2 and you'll have to build it back up. Whichever side the first Kadoatie appears on, try and stick to that side for the rest of the game. (If you're going for the high scores table then I would keep restarting the game until the Kad appears on the right-hand side of the tree since the bar begins in the middle and travels to the right first, thus saving you those all important few seconds). Deciding whether or not you can safely stretch your tower to reach the next Kadoatie is the crux of the game and with practice you will learn how much space it takes to build at an angle to reach from one side of the screen to the other. In the meantime though, it's best to stick to just saving the ones on one side of the tree and the odd straggler who is sat close enough to the trunk for you to reach them without wavering all over the place. Start off with a flurry by stacking 8 or 9 Warfs on top of each other straight away. Because they are so close to the ground you don't need to put so much force into the meter to get them high enough to land on the top, so you can click and release fairly rapidly to get yourself started. It may take a few tries to perfect this method but once you've got it down you can cram in those extra few points even quicker. After that, wait for the pointer to go to the end of the bar and come back. Once it is either touching or exactly overlapping the little red marker from the previous hurl, click and let it fill about 4/5 to the maximum then release. AS SOON as you release, click again and hold until it reaches the maximum and then release; then repeat as soon as you release to fire off a third Warf at full strength. After this, pause a moment for the game screen to move up and give you room to fire the next lot of three Warfs up on top of each other. If you think you can fit a fourth Warf in then go for it. Repeat until an arrow appears to show you where the next Kadoatie is positioned. As soon as you know where the Kad is then you can start to aim for it by slowly leaning the tower of Warfs you have amassed. To do this, simply wait a fraction of a second longer in between releasing the mouse button to launch one Warf and clicking it again to charge up the next one. As soon as you rescue a Kadoatie, pause for a moment to allow the arrow for the next one to appear. It might seem like you're wasting time but it's better to hang fire a moment so you have that little extra space and time to get into the right position for it, rather than continuing to build your tower then realising the Kadoatie is too far over to one side and you'll never be able to safely lean far enough to rescue it. And if all else fails, you can type in 'trappedkadoaties' to receive an extra life at any point during the game. not PUT your Kadoatie on the... oh, forget it. The Neopoint ratio on this game is usually really good so you won't need very many points to net yourself the maximum 1,000 Neopoints for each play. With a little practice you will soon get a good feel for the game and will be better able to judge how hard you need to fire Warfs and when it is possible to reach for a Kad and when it's a lost cause. If you're aiming for a trophy then good luck; if you're after Neopoints then, well, good luck as well, I guess. :P Now go forth and break the laws of physics!